Do you crave the flavor of the hot Deep South? Do you love the smell and taste of well-seasoned food that yields a ton of flavor? 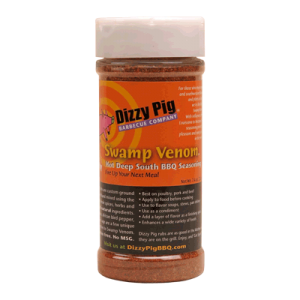 In this Dizzy Pig Swamp Venom Review, I will be giving you my pros and cons of Dizzy Pig Swamp Venom Seasoning. We will discover if Dizzy Pig Swamp Venom really adds that big punch of Deep South flavor you are looking for. I recently bought an 8oz bottle of Dizzy Pig Swamp Venom seasoning made by the Dizzy Pig BBQ Company. I made the decision to purchase this seasoning after my initial order of a 13 pack sampler of Dizzy Pig Original Blend flavors. Dizzy Pig “Raising The Steaks” seasoning and the “Swamp Venom” seasoning are two of my favorites from the sampler. Not only am I a sucker for trying the latest and greatest in seasonings and spices, (my girlfriend calls me the spice hunter,) anything that can seriously add that Cajun and Southwestern influenced flavor to my food had me sold. Combine this with the fact that this multi-purpose seasoning can be used on several different types of foods and this purchase was a no-brainer for me. I mean seriously, I can’t count how many times I’ve purchased a seasoning promising to bring the big flavor of the Deep South, only to be disappointed. I think back to all the wasted $$ and sub par tasting food and kick myself for not finding this seasoning sooner. It was even a hit with my four-year-old daughter who loved it despite the spiciness. Ok, that’s what the Dizzy Pig Brand claims at least. They make a very strong case while making this seasoning sound very impressive. But does it actually live up to their claims? The rest of this review will be devoted to my experiences with using this seasoning. Going from other store brand Cajun-style seasonings that I have tried to Dizzy Pig Swamp Venom was like going from fast food to a high scale restaurant. While the first will do the job and fill your belly, the second will have your taste buds doing the happy dance and leave you with a satisfied smile on your face. So far, I have used Swamp Venom to season chicken, fish and pork shops. A big thumbs up for all from me. But my absolute favorite is when I use it to season shrimp. Grilled and scampi style shrimp on the “barbie” came out great. I’ve also sprinkled some on rice and vegetables before serving them and get great reviews. The big, bold flavor difference had me coming back for third helpings. Even though I describe this seasoning as having “Big Bold Flavor” it is not overpowering to the food. In my opinion, it helps bring out and highlight the natural flavor of all the foods I tried while adding a Deep South influence. Dizzy Pig products use only ALL NATURAL whole spices and are made with only high quality, fresh and natural ingredients. No artificial extras. They are allergen friendly and don’t use peanuts or tree nuts. Dizzy Pig doesn’t like additives with words they can’t pronounce. So you’ll never find MSG, anti-caking agents or unmentionables in their seasonings. I think I’ve brought this one up enough that you already get the picture. But just in case, let me mention it again. Swamp Venom is an outstanding blend of spices that adds a little kick with great flavor. Dizzy Pig Swamp Venom seasoning stacked up very well to all my needs and added an additional “Deep South” flavor factor to the mix. Seasoning my food with this spice has made me a happy man. The only gripe I have is it is not as spicy as advertised. If spicy heat is not your thing, then don’t let the name and the claims scare you off. It’s really not that spicy, just a little kick. One more thing that is more of an inconvenience than a gripe is that I can not get Dizzy Pig brand seasoning at any of my local stores. I can only order them online. But again, a slight inconvenience that is more than made up for in the quality and performance of this spice. Bottom line, Yes, I am a fan of not only the Swamp Venom seasoning but almost the entire line of Dizzy Pig seasoning offerings. If you are a fan of that Deep South flavor and you love the smell and taste of well-seasoned food that yields a ton of flavor, then this seasoning is for you. Would I recommend Dizzy Pig brand Swamp Venom Seasoning? That would be a Big Yes for this product! I’ve done a bit of research on where to buy Swamp Venom, and so far the best place to buy it is Amazon. It is hard to beat Amazon shipping prices and many times they will ship for free. They also offer same day shipping if you want it right away. Amazon is also one of the most reliable companies when it comes to purchases. Amazon has a 30-day return policy. If the product doesn’t work out, you can just return it for a full refund within 30 days, no questions asked. If you have any questions about this Dizzy Pig Swamp Venom Review or want to leave a review of this product of your own, leave a comment below. 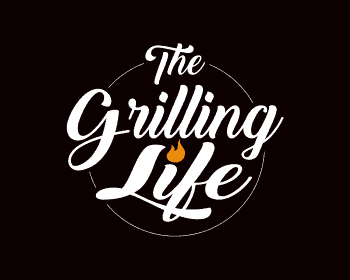 I hope you found this review helpful and you are one step closer to joining me in “The Grilling Life”! This spice sounds pretty awesome. I have no seen it sold in any store around me. I think I would remember. Do you use it on your chicken? How do you think it would be with grilled chicken and this dry seasoning added to it? or do you have a better way to prepare it with chicken? As a matter of fact, I just grilled chicken breasts last night using this seasoning. It came out awesome if I say so myself. 🙂 I usually apply a thin layer of olive oil to the chicken breasts then liberally coat them with the seasoning with Dizzy Pig Swamp Venom on both sides before grilling. I hope this helps. Great review! I used to use a cajon spice called “Slap Yo Mama” (something like that). It was pretty darn good, but I found I could create the exact same spice at home without having to order it online (as I couldn’t buy it here in Canada). If you have every tried the Cajun spice I mentioned could you possibly compare the two? I’m always looking for a new type of wing spice as my boys and I love our Cajun wings. I have used Slap Yo Mama and in fact, have a shaker of it in my spice cabinet. I am not as big of a fan. Although it has a decent heat to it, I’m not in love with the flavor as much. Swamp Venom really adds the flavor compare to Slap Yo Mama seasoning. The ol’ Dizzy Pig sounds interesting. One question: does it contain garlic? I am one of those who has bad reactions to that little weed, which doesn’t hurt so much because I hate the stuff. Still, I am sure you can find me a decent alternative. Cheers. Mike, Swamp Venom does contain Garlic (which some people have sensitivities to.) Believe it or not, Weber Seasoning, N’Orleans Cajun is pretty good as well for a cheap alternative. Hope this helps. Dizzy-Pig-Swamp Venom sounds awesome. I am always looking for new ways to enhance my dishes. In your review, you mention meat and chicken. I’m anxious to try it on fish that I grille. It sounds alike like a spice that I mix up with my ground turkey. If it compliments the meat and fish you refer to I’m sure it will make my turkey burgers I grill out of this world. I have used Keywest in the past which is also great spice. It isn’t spicy, though. I can’t wait to get my hands on this Dizzy-Pig-Swamp-Venom. Another spice in my arsenal. I really do enjoy this seasoning and I have tried it on everything except beef. Swamp Venom is a good addition to any spice rack. Patrick, according to the product description, it looks like this Swamp Venom seasoning will enhance most anything! I’m a big chili lover and would like to see if it will cause my “tongue to slap my brains out” on chili. I was surprised to see that it goes well with nuts! My wife isn’t a meat eater. I think I’ll surprise her! I’m also glad to hear you say that it isn’t overtly spicey, because I’m more a fan of mild spices. Thanks for this post. I had never heard of Dizzy Pig Swamp Venom! Even though I have not tried it on chili yet, it is on my to-do list. I have read good things. Let us know how it comes out if you try it. Sounds pretty awesome, I especially love the name swamp venom. It makes me think of the time I visited South Carolina swamps with my American friend to visit his dad and we ended up grilling alligator! It was amazing and had a distinct cajun flavor! I remember asking for the secret of the spices, but he just laughed and told me it was a family secret! I will be ordering some and using it with fish! The name alone made me want to try it as well. It has been several years since I have tried alligator and I think this would actually go quite well on it. Let us know how your fish comes out. I really enjoy spicy foods and if it isn’t spicy enough when it’s supposed to be I get disappointed as well. I usually have a jalapeno or two on hand for these times. I like southern tastes of gumbo and creole so if this spice has some of that flavor then I would be sold. You really can’t go wrong with a name like that. I would think that if you put the word venom in anything, it has to live up to the name in flavor or heat. If not I will be shocked and disappointed. I’ll let ya know what I think after I try it, Patrick. I agree with you, David. The spicier, the better….as long as the flavor is still there. I love the name too. I hope you enjoy the seasoning. I recommend all the dizzy pig spices by the way. Hi Patrick, great review of Dizzy Pig Swamp Venom seasoning. I love Deep South spice so I am really looking forward to trying this out. Great that they dropped any rubbish additives too. I’d like to try this on burgers, this would be my first go I think. Great that Amazon deliver free isn’t it. Means we don’t have to hunt for it and we can order from the comfort of our home. Dizzy Pig come up with some really great names for rubs don’t they? Red Eye Express and Jamaican Firewalk spring to mind! They really are a quality company who only uses all natural ingredients. Being able to order Dizzy Pig Swamp Venom seasoning through Amazon is great. Very convenient if you ask me. The names are pretty awesome as well.